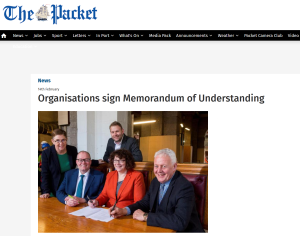 The Falmouth Packet has explored how the recognition of the importance to residents and businesses of Cornish culture, heritage and the arts has been reinforced when major investors in culture signed a Memorandum of Understanding (MOU) to work closely together to promote Cornwall’s distinct identity. Representatives from Cornwall Council, Cornwall and Isles of Scilly Local Enterprise Partnership (LEP), Arts Council England, The National Lottery Heritage Fund and Historic England signed a historic Memorandum of Understanding on Wednesday. The first of its kind in the UK, it is a commitment that all will work together so that Cornwall Council, which has through its Culture Investment Board so far secured over £110 million of investment into Cornwall’s culture and heritage, can continue to support and promote Cornwall’s cultural distinctiveness. Regeneration and relaunch of arts venues like the Hall for Cornwall and Tate St Ives.